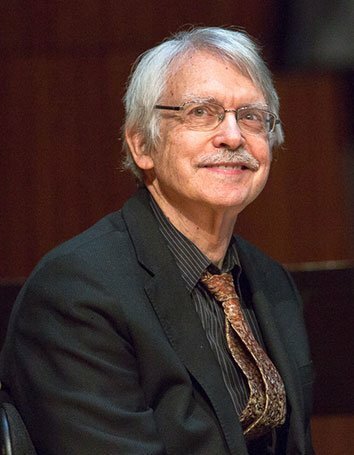 As this year’s recipient of the György Kepes Fellowship Prize at MIT, John Harbison, together with his violinist wife Rose Mary (they have been married for 52 years) and a combo of colleagues, gave a concert on Sunday afternoon at Killian Hall for a lot more friends — the hall was filled to standing-room-only. Now 77 years old, John been well known in the Boston area ever since 1963, when he arrived as a Junior Fellow at Harvard. A composer above all, he also performs actively; as an all-around practical musician he has a remarkable spectrum of abilities and accomplishments. I have heard him play valve trombone in a jazz combo, and he once told me that in high school he once played Serge Koussevitzky’s Concerto for Double Bass in an arrangement for tuba. I have heard him play viola in chamber groups and I have heard his smooth baritone voice (once in Don Giovanni as the Commendatore). I have played piano four hands with him, though not for many years; mostly I have seen him conduct. Such versatility is a marvel not often found today even among the world’s best-known professionals. (Rose Mary has it too; she probably doesn’t do it anymore, but I still remember years ago hearing her play Chopin’s Opus 10 No. 1 Etude with admirable effortlessness.) But on Sunday John’s piano and Rose Mary’s violin were dazzling, not for technical perfection but for fine sound and complete assurance of the music, offered in thanks for the company of admiring friends. The “heavy” first half led off with a Sonata for violin and continuo by Bach, BWV 1023. The Adagio first movement is a recitative-like fantasia, the violin in brilliant improvisatory style; it was followed by a flowing Allemande and a bouncy Gigue. Harbison provided the continuo reading directly from figured bass; he told me he probably missed a few suspensions, but if so I didn’t hear them. Reading figured bass at the keyboard is still urged in Piston’s Harmony but rarely taught in theory classes today; for keyboard players, no other practical theory is more valuable. Mozart’s A Major Violin Sonata, K. 526, the most complex of his violin sonatas, was written in 1787, at about the same time as Don Giovanni (K. 527). The opening Molto allegro in 6/8 is followed by a mysterious Andante replete with melodies a 2 in octaves. The finale, Presto, is one of Mozart’s most difficult examples of piano writing, a moto perpetuo rather in the same vein as the Presto finale of the 23rd Piano Concerto, K. 488, in the same key. The effort for both players was heroic, but entirely successful, especially in projecting the very different moods of the three movements in a coherent manner. This was lovable and loving music. Harbison’s own Violin Sonata No. 2 achieved its Boston premiere at this concert. His notes say that the work is “in some sense a retreat” from the public aspect of his Violin Sonata no. 1 of three years ago, and “was never meant for circulation.” If it still sounds like a private affair, No. 2 has the conviction of both strength and warmth. The first movement, Adagio, is characterized by well-spaced polychords in the manner of Stravinsky’s Symphonies of Wind Instruments, serving to underscore the violin, which declaims in a broadly melodic manner with bent pitches, slides, and parallel sixths; it also speaks with senza vibrato that is touchingly expressive. The Moderato that follows is more active, with bluesy chords in the piano supporting a kind of fantasia dialogue with the violin, with plenty of scale figures; there is a confident feeling of blurred G major. That tonal feeling becomes stronger in the Commodo third movement, along with some well-formed phrases in foxtrot figures and a D minor that eventually ends in C major. One hopes that this attractive piece will come into circulation, however limited; it may not be for everybody, but those of us who heard it feel that it was in a real sense for us. After the intermission the Harbisons returned as a jazz duo (“Our other life,” Rose Mary said, reminding audience members to visit their Token Creek concerts in Wisconsin during the summer) to play three songs by Jimmy Van Heusen (1913-1990): “I Thought About You,” “But Beautiful,” and “Imagination.” It was refreshing to hear these with the violin, with lively ornamented piano melody underneath. 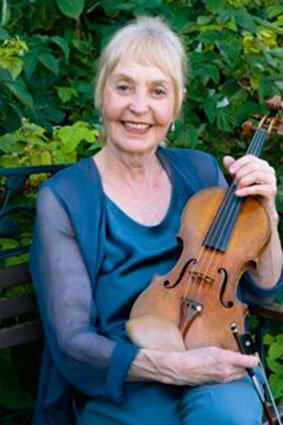 A small but vivid combo joined the piano and violin for three Harbison premieres: “Truth and Consequences,” “The Slow Samba,” and “Für Clarise”. The combo goes by the name SIN: “Strength In Numbers,” which sounded only occasionally sinful. These were Evan Ziporyn, soprano sax and bass clarinet; Dylan Sherry ‘12, tenor sax; Mark Harvey, trumpet; Keala Kaumeheiwa, bass; Fred Harris, drums; and Liz Tobias, singer in the last two numbers. Harbison himself provided the texts, including “When the clocks don’t chime, / and the calendar’s out of time, Clarise” which was offered to the concert manager, who was present: “We’re never asking for release. / We’re only asking for Clarise.” “The Slow Samba” sounded to me more like a tango than a samba, but it was a nice rich E minor, and it was Brazilian enough. It was a fine afternoon to gather old friends and good music.